This week, we took comfort in the nostalgia of folk music and fried chicken after the robots warned us that Big Art is coming to destroy us. From the sounds of blues guitarist and singer Lead Belly to recordings of Southwestern Woodhouse Toads, Smithsonian Folkways has been capturing the sounds of global history for the past 70 years. These recordings are among 60,000 treasured tracks the label has in its library — and it promises they’ll never go out of print — from the labor songs of Woody Guthrie and children’s songs of Ella Jenkins to New Orleans hot jazz, songs of the civil rights movement, the Honk Horn music of Ghana and so much more. And for this next story we have traveled down to the National Mall. We’re on the front steps of the National Air and Space Museum, part of the Smithsonian. It’s a spring day. There’s tourists lining up, trying to get in the doors. We have come because this museum is getting a new boss. And she’s just waiting for us inside. Let’s go meet her. Read Mary Louise Kelly’s interview with Ellen Stofan for NPR. Even the food is a rare sight to behold at these 17 restaurants located in art museums and cultural institutes across the country. 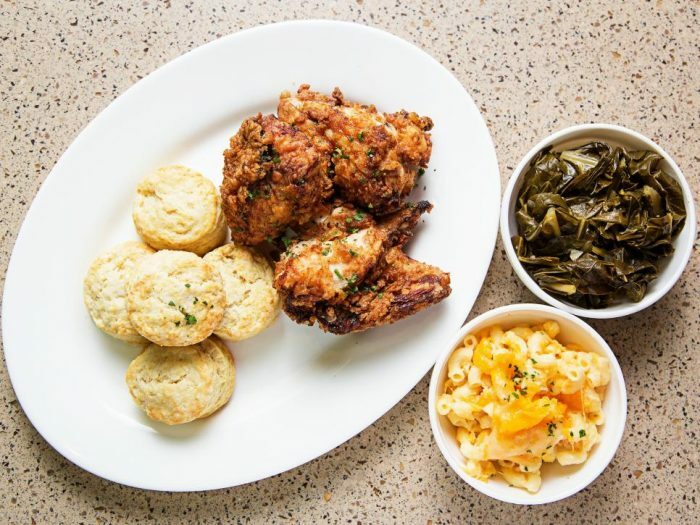 Sweet Home Cafe at National Museum of African American History and Culture, Washington D.C.
Sweet Home Cafe, overseen by culinary ambassador Carla Hall and award-winning Executive Chef Jerome Hall (previously of Mitsitam), showcases the culture and history of African-Americans through food with traditional dishes and modern interpretations. Ingredients are sourced from local, sustainable growers when possible, and the cafe favors products from African-American-owned businesses. Those components are used in four distinct stations that represent regions deeply impacted by African-American culinary traditions. The Agricultural South station serves items like buttermilk fried chicken and Brunswick stew. At the Creole Coast station, you’ll find pan-fried Louisiana catfish po’ boys. In the North States, you can try Caribbean-style pepper pots and oyster pan roasts, and at the Western Range, you can order dishes like “Son of a Gun” stew and pan-roasted rainbow trout with cornbread. Read more from Sara Ventiera for the Food Network. When cultural institutions rely on monster traveling shows like Kusama and Bowie, we all lose. 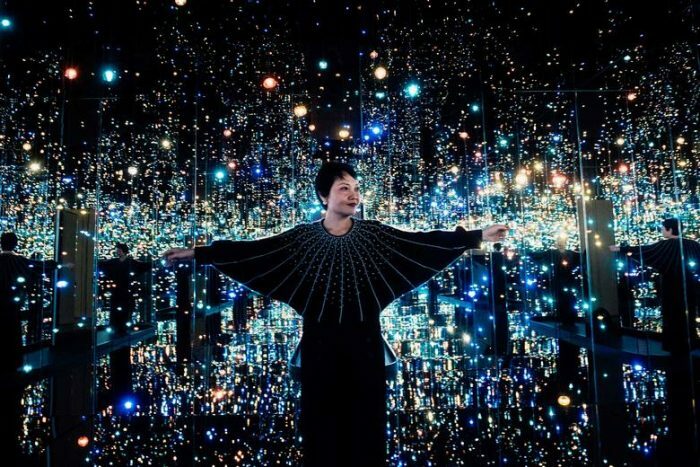 Yayoi Kusama’s Infinity Mirrors exhibition curator Mika Yoshitake poses at the Hirshhorn Museum on Feb. 21, 2017 in Washington. They should have called it Kusama: Infinity War. The biggest blockbuster in Hirshhorn Museum history opened in Washington, D.C., on Feb. 23, 2017, and was ultimately seen by nearly 160,000 people before moving on to Seattle, Los Angeles, and now Toronto. * Up next: Cleveland and Atlanta. All those cities were locked in before opening date. They knew exactly what they were getting, much like theaters showing the new Avengers movie. Blockbusters these days are predictable and highly lucrative. The Hirshhorn saw its membership increase by 6,566 percent as a result of putting on Kusama: Infinity Mirrors, and advance tickets in Seattle had sold out before it even opened there. The David Bowie Is show that’s been touring the world for five years now has been seen by millions; if you want to go to its final stop in Brooklyn, New York, tickets could set you back as much as $2,500. Read more from Felix Salmon for Slate. Museum visitors are accustomed to having docents guide them around the exhibits. But what if your guide was a metallic, glassy-eyed robot? This isn’t Star Wars: Return of the Docents. It’s a program now underway at a half-dozen Smithsonian museums. The robots — all named Pepper — are about four feet tall and bright white. They have big eyes and undeniably adorable little smiles. They don’t have legs, but they do have arms and hands that make eerily human-like gestures when they talk. They also don’t have an assigned gender. 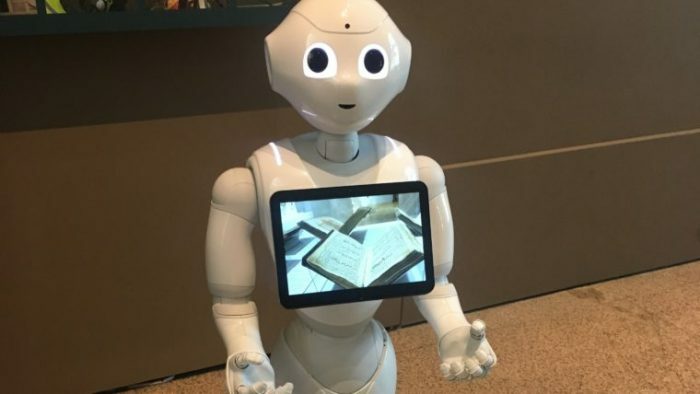 The robots are currently deployed to guide visitors through areas of confusion at the selected Smithsonian museums, and draw people toward under-appreciated spots. Read more from Mikaela Lefrak for WAMU.